The Component class provides a read-only view of a Block interpreted as a name component. Although it inherits mutation methods from Block base class, they must not be used, because the enclosing Name would not be updated correctly. Definition at line 50 of file name-component.hpp. Construct a NameComponent of TLV-TYPE type, using empty TLV-VALUE. Error the NameComponent is invalid (see ensureValid). Definition at line 52 of file name-component.cpp. Construct a NameComponent from block. This contructor enables implicit conversion from Block. Definition at line 58 of file name-component.cpp. Construct a NameComponent of TLV-TYPE type, using TLV-VALUE from buffer. This constructor does not copy the underlying buffer, but retains a pointer to it. Therefore, the caller must not change the underlying buffer. Definition at line 64 of file name-component.cpp. Construct a GenericNameComponent, using TLV-VALUE from buffer. Definition at line 92 of file name-component.hpp. Construct a NameComponent of TLV-TYPE type, copying TLV-VALUE from buffer. Definition at line 100 of file name-component.hpp. Construct a GenericNameComponent, copying TLV-VALUE from buffer. Definition at line 109 of file name-component.hpp. Construct a NameComponent of TLV-TYPE type, copying count bytes at value as TLV-VALUE. Definition at line 70 of file name-component.cpp. Construct a GenericNameComponent, copying count bytes at value as TLV-VALUE. Definition at line 123 of file name-component.hpp. Construct a NameComponent of TLV-TYPE type, copying TLV-VALUE from a range. Definition at line 137 of file name-component.hpp. Construct a GenericNameComponent, copying TLV-VALUE from a range. Definition at line 146 of file name-component.hpp. Construct a GenericNameComponent, copying TLV-VALUE from a null-terminated string. Bytes from the string are copied as is, and not interpreted as URI component. Definition at line 76 of file name-component.cpp. Construct a GenericNameComponent, copying TLV-VALUE from a string. Definition at line 81 of file name-component.cpp. Definition at line 397 of file name-component.cpp. References ndn::Block::type(), ndn::Block::value(), and ndn::Block::value_size(). Definition at line 410 of file name-component.cpp. Definition at line 426 of file name-component.cpp. Decode NameComponent from a URI component. The URI component is read from [input+beginOffset, input+endOffset) range. Error URI component does not represent a valid NameComponent. Definition at line 195 of file name-component.hpp. Referenced by fromEscapedString(), and ndn::Name::Name(). Definition at line 205 of file name-component.hpp. Definition at line 102 of file name-component.cpp. References ndn::Block::find(), ndn::name::detail::ComponentTypeTable::findByUriPrefix(), ndn::tlv::GenericNameComponent, ndn::name::detail::getComponentTypeTable(), ndn::tlv::NameComponentMax, ndn::tlv::NameComponentMin, ndn::name::parseUriEscapedValue(), ndn::to_string(), and ndn::Block::type(). Write *this to the output stream, escaping characters according to the NDN URI Scheme. This also adds "..." to a value with zero or more "." Definition at line 126 of file name-component.cpp. References ndn::name::detail::ComponentTypeTable::get(), ndn::name::detail::getComponentTypeTable(), ndn::Block::type(), and ndn::name::detail::ComponentType::writeUri(). Convert *this by escaping characters according to the NDN URI Scheme. Definition at line 132 of file name-component.cpp. Check if the component is nonNegativeInteger. Definition at line 142 of file name-component.cpp. Check if the component is NameComponentWithMarker per NDN naming conventions. Definition at line 149 of file name-component.cpp. References empty(), ndn::Block::value(), and ndn::Block::value_size(). Referenced by isSegment(), isSegmentOffset(), isSequenceNumber(), isTimestamp(), isVersion(), and toNumberWithMarker(). Check if the component is version per NDN naming conventions. Definition at line 157 of file name-component.cpp. Check if the component is segment number per NDN naming conventions. Definition at line 163 of file name-component.cpp. Check if the component is segment offset per NDN naming conventions. Definition at line 169 of file name-component.cpp. Check if the component is timestamp per NDN naming conventions. Definition at line 175 of file name-component.cpp. Check if the component is sequence number per NDN naming conventions. Definition at line 181 of file name-component.cpp. Interpret this name component as nonNegativeInteger. Definition at line 189 of file name-component.cpp. Interpret this name component as NameComponentWithMarker. Error if name component does not have the specified marker. tlv::Error if format does not follow NameComponentWithMarker specification. Definition at line 198 of file name-component.cpp. 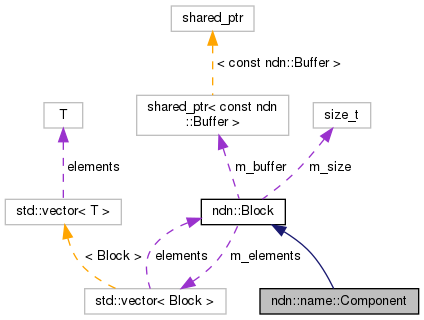 References isNumberWithMarker(), ndn::tlv::readNonNegativeInteger(), ndn::Block::value_begin(), ndn::Block::value_end(), and ndn::Block::value_size(). Referenced by toSegment(), toSegmentOffset(), toSequenceNumber(), toTimestamp(), and toVersion(). Interpret as version component using NDN naming conventions. Definition at line 209 of file name-component.cpp. Interpret as segment number component using NDN naming conventions. Definition at line 215 of file name-component.cpp. Interpret as segment offset component using NDN naming conventions. Definition at line 221 of file name-component.cpp. Interpret as timestamp component using NDN naming conventions. Definition at line 227 of file name-component.cpp. References ndn::time::getUnixEpoch(), ndn::name::TIMESTAMP_MARKER, toNumberWithMarker(), and ndn::Block::value(). Interpret as sequence number component using NDN naming conventions. Definition at line 234 of file name-component.cpp. Create a component encoded as nonNegativeInteger. Definition at line 242 of file name-component.cpp. Referenced by ndn::Name::appendNumber(), ndn::security::tpm::BackEnd::createKey(), and ndn::security::CommandInterestPreparer::prepareCommandInterestName(). Create a component encoded as NameComponentWithMarker. NDN-TLV := TLV-TYPE TLV-LENGTH TLV-VALUE? Definition at line 248 of file name-component.cpp. Referenced by ndn::Name::appendNumberWithMarker(), fromSegment(), fromSegmentOffset(), fromSequenceNumber(), fromTimestamp(), and fromVersion(). Create version component using NDN naming conventions. Definition at line 268 of file name-component.cpp. Create segment number component using NDN naming conventions. Definition at line 274 of file name-component.cpp. Create segment offset component using NDN naming conventions. Definition at line 280 of file name-component.cpp. Create sequence number component using NDN naming conventions. Definition at line 286 of file name-component.cpp. References fromNumberWithMarker(), ndn::time::getUnixEpoch(), ndn::name::TIMESTAMP_MARKER, and ndn::Block::value(). Definition at line 294 of file name-component.cpp. Check if the component is GenericComponent. Definition at line 302 of file name-component.cpp. Check if the component is ImplicitSha256DigestComponent. Definition at line 308 of file name-component.cpp. Referenced by ndn::Interest::matchesData(), and ndn::Exclude::wireDecode(). Definition at line 314 of file name-component.cpp. Definition at line 320 of file name-component.cpp. Check if the component is ParametersSha256DigestComponent. Definition at line 326 of file name-component.cpp. Definition at line 332 of file name-component.cpp. Definition at line 338 of file name-component.cpp. Definition at line 485 of file name-component.hpp. Referenced by compare(), equals(), isNumberWithMarker(), ndn::KeyParams::KeyParams(), and ndn::security::tpm::BackEnd::setKeyName(). Check if this is the same component as other. true if the components are equal, otherwise false. Definition at line 346 of file name-component.cpp. References empty(), ndn::Block::type(), ndn::Block::value_begin(), ndn::Block::value_end(), and ndn::Block::value_size(). Compare this to the other Component using NDN canonical ordering. other The other Component to compare with. Definition at line 355 of file name-component.cpp. References empty(), ndn::Block::hasWire(), ndn::Block::size(), ndn::Block::type(), ndn::Block::value(), ndn::Block::value_size(), and ndn::Block::wire(). Referenced by ndn::Name::compare(), operator<(), operator<=(), operator>(), and operator>=(). Definition at line 519 of file name-component.hpp. Check if this is not the same component as other. Definition at line 530 of file name-component.hpp. Check if the *this is less than or equal to the other in NDN canonical ordering. Definition at line 542 of file name-component.hpp. Check if the *this is less than the other in NDN canonical ordering. Definition at line 554 of file name-component.hpp. Check if the *this is greater or equal than the other in NDN canonical ordering. Definition at line 566 of file name-component.hpp. Check if the *this is greater than the other in NDN canonical ordering. Definition at line 578 of file name-component.hpp. Get the successor of this name component. C represents the set of name components, and X,Y ∈ C.
Operator < is defined by canonical order on C.
Y is the successor of X, if (a) X < Y, and (b) ∄ Z ∈ C s.t. X < Z < Y. In plain words, successor of a name component is the next possible name component. successor of sha256digest=0000000000000000000000000000000000000000000000000000000000000000 is sha256digest=0000000000000000000000000000000000000000000000000000000000000001. successor of sha256digest=ffffffffffffffffffffffffffffffffffffffffffffffffffffffffffffffff is params-sha256=0000000000000000000000000000000000000000000000000000000000000000. successor of params-sha256=0000000000000000000000000000000000000000000000000000000000000000 is params-sha256=0000000000000000000000000000000000000000000000000000000000000001. successor of ... is %00. successor of A is B.
successor of FF is %00%00. Definition at line 380 of file name-component.cpp. References Component(), ndn::name::detail::ComponentTypeTable::get(), ndn::name::detail::getComponentTypeTable(), ndn::name::detail::ComponentType::getMinValue(), ndn::name::detail::ComponentType::getSuccessor(), ndn::Block::type(), and ndn::Block::value().